To be quite honest, the Cyclocross Gallery really doesn't get a whole lotta love. Which is humorous to me, as way back in dialup days, the whole Cyclofiend.com website, really came into being around things cyclocrossy (cyclocross-ish? cyclocross-esque?... anyway...). It does point out that however large the cult/tribe/band grows, no matter how many cheering viking-throng photos filter out of Portland, SF or Seattle, it's still a subset of bicycling at large, and an off-seasony, oddish one at that. Which is fine. Wouldn't have it any other way. But, it does tend to impact the number of images which folks supply of dedicated CX bikes. Plus there's probably less opportunity, as most cross bikes live short, brutish lives, aging many years in each season, if actually raced. 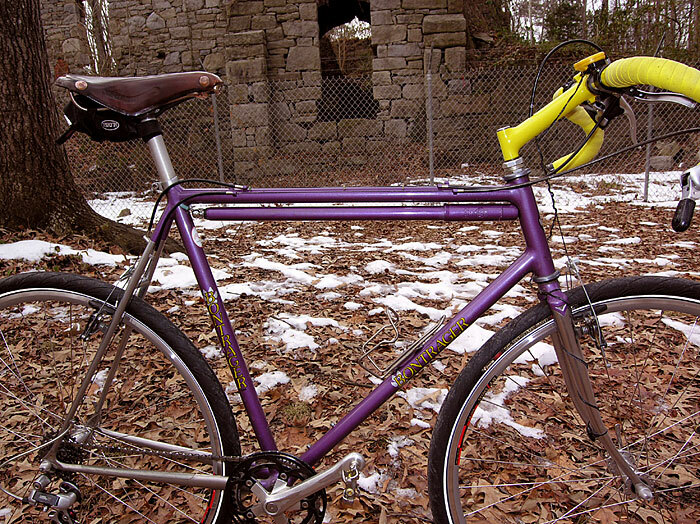 That does make the cross bike images a bit more special, and when you get a chance to enjoy something as unique as Paul Germain's fillet-brazed Bontrager Cross bike, it is indeed a treat. As Paul points out in the description, a fillet-brazed Bontrager is reasonably rare. (And you know that the Bontrager Cross models are not all that common.) I've never seen one with the nickel treatment on the stays and fork, and the addition of the Steve Potts stem just ties this bike off very nicely. Yes! What an awesome bike.